Headstand: An āsana in which you balance on your elbows, arms, and head. Known as the “King of the Āsanas” because of its remarkable benefits, the Headstand is the first of the 12 āsanas and is excellent for improving concentration, increasing memory, and transforming libido into powerful life force. In addition, people who practice Śīrṣāsana on a regular basis tend to have slower rates of respiration and heart rate. To the surprise of many first-time students, this pose does not require any special strength or flexibility; all it takes is practice and going step-by-step. 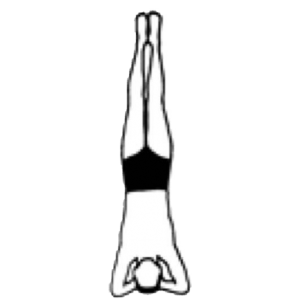 Even so, you may wish to begin by undertaking the Dolphin, progressing to the full Headstand over time. Gently leave this āsana as carefully as you entered it.